Is high tide the best time to see the amazing rich red soil, and the coloured layers of the rocks against the astonishing blue sea at Gantheaume Point Broome? Well … maybe! Broome’s iconic point, at the northern end of the 22km white sand curve of world famous Cable Beach, is a stunning scenic masterpiece during the strong light of day. The lighthouse, set on the rocks above the point, marks a spectacular and ever-changing vista as ospreys feed their young on the nest in the lighthouse framework, tourists conduct impromptu photoshoots and fishermen try their luck from the rocks below. Broome, in Western Australia’s north-west, is a rare combination of outback and coastal landscapes, where the Kimberley meets the coast in a startling shock of colour from the dramatic contrast of red soil and rock of Pindan country with clay-coloured ocean so blue it looks like it’s sucked all the colour from the sky. But with Broome having one of the largest tidal movements in the southern hemisphere, Gantheaume Point’s low tide view is an intriguing alternative. At tides lower than 2.16 metres, climb down to explore the rocky – and slippery – platform that emerges below the lighthouse. Amongst the live coral, seaweed and rock pools, look for the dinosaur footprints that show where Megalosauropus Broomensis and others once roamed. Viewing the point from below gives an entirely different perspective to the views from the vantage points above – and is therefore a photo opportunity not to be missed! Just down the harbour road and around the corner on the point’s southern side is yet another perspective, with rock formations stretching all the way down the coast. The ‘Bingle-Bingles’ are a miniature – and far more easily accessible – alternative to Western Australia’s ‘other’ main attraction, the magnificent ‘Bungle Bungles’! And at sunset the landscape changes all over again. As do the visitors. A pair of grey nomads, clutching their ‘happy hour’ drinks while attempting to negotiate the steep, slippery rocks moan about the ‘crowds’ while reminiscing about an long ago – and therefore ‘better’ – time when they were the only visitors. A clutch of French backpackers fish for supper from the rocks. And a forest of tripods with enough expensive camera gear to sink the Titanic appears as the sun sinks into the sea. 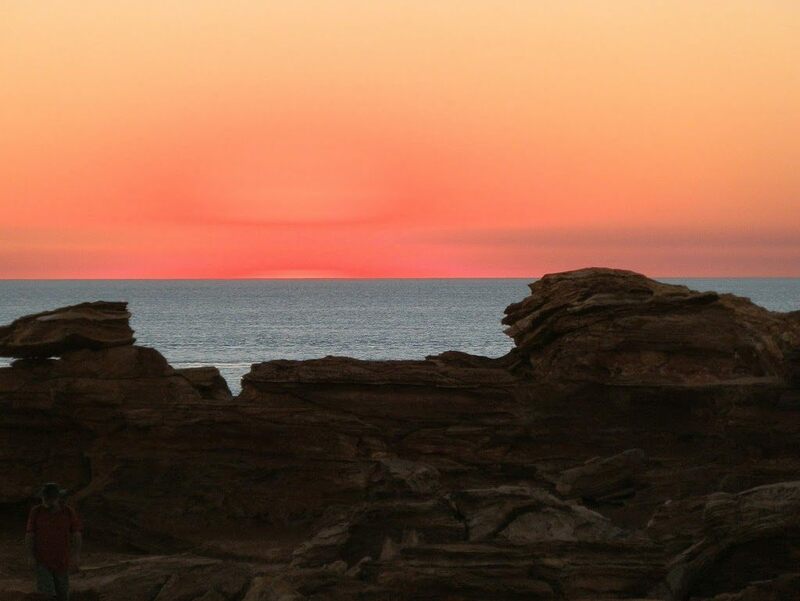 So when IS the best time to visit Gantheaume Point Broome? You’ll just have to decide that for yourself! « Save the Poor Bustard! So beautiful! I like the rocks. @TheChieftess – It’s even better live!! @lorik – Thank you so much! Orange/Red and Rocks play a BIG part in this blog – so you won’t be disappointed! @Chris Twyman & Angela – It’s pretty hard to take a bad shot of such amazing scenery! @Liz – It’s just another typical day downunder!!! @Pieces of Sunshine – It’s a marvellous spot! This was my first visit – but it sure won’t be my last! @Judy – This is incredible rock in ANY light – but the evening glow really puts a special face on it! @Chubskulit Rose – It’s all good downunder! @Miriam – This is what winter in northern Australia looks like!! Drop by anytime you need a sunshine fix!!! That is amazing scenery!! I love the last shot, where the sun catches the striations in the rock!! Broome looks like an amazingly beautiful place. I’ve not been to WA (yet). Wonderful pics. The sunset is stunning. Have a fabulous week. I am so glad you joined Mandarin Orange Monday – and that I have discovered your wonderful blog! Your photographs are beautiful… very orange:))…and i also have a passion for rocks! Perfect. @ruma – Thank you, my friend! It’s always a pleasure to hear from you! @darlin – Hahaha, what are those??!! @NatureFootstep – Thank you for returning my visit! thanks for visiting NF Inspiring Photography. Wow! Amazing location and amazing shots. I am totally jealous! @darlin – Haha, I bet you’re missing downunder warmth as you head into autumn!! Whoops – did that make you jealous??!! @Sallie – I hadn’t seen anything like it either!! It’s awesome and I’m glad my pix convey it!! @eileeninmd – Thank you!! It’s always a pleasure to show you round downunder! @Kath – Haha! Sorry, couldn’t help a smug chuckle there … although now I’m home down south the warmth is a distant memory. For now!! @Beach Bum – This is one hell of a place to blow your mind – and all your other senses as well!! Have I convinced you to come down here yet??!! @TakenForGranted – It’s a pleasure, look forward to conducting a virtual OZ tour for you! @Iris – It was VERY slippery on the rocks – because it had been underwater only a couple of hours before! I had a film camera until recently – many of my shots have been scanned and saved as jpeg files – perhaps you could try it? @Friko – My point exactly! @Sara – Thank you!! It’s pretty hard to take a bad photo here! @Are We There Yet – Haha, it was fine and warm every day we were there!! @PDP – Yes, it’s a winning combination – just lucky there’s so much of it around. For now! Seeing something like that blows my little mind, to me its a direct connection to a truly alien world. Wow! I’ve seen red rock terrain, and cliffs, and oceans and seacoasts, and outback territory (or what passes for it over here…there are some wild areas)…but I’ve NEVER seen all that in one place. What a wonder this place is! The colours just POP out of the screen, especially here in Switzerland on a grey and drizzly day. Wow, gorgeous scenes and photos. The rock colors and the sunset are beautiful. The best time to visit here would be anytime… it’s so beautiful and scenic. I could sit and watch the ocean all day long, hike through the rocks, or take a dip in the ocean… if it’s warm enough now. Beautiful photos of a stunning place. Actually the best time would be right now… it’s getting chillier by the day here. Love the beautiful RED sunset. Red at night, sailors Delight! The contrast of the red and green at Pindan at Gantheaume Point, Broome, WA is breath taking. Every shot a gem Red, you can’t beat red earth and rock against the vast blue sky. What an amazing country we are lucky enough to live in, lets hope it remains that way. What a beautiful series. I like the cropping, too. That wonderful, warm light! Aw, it really is so sad there were no digital cameras available in 1999 (at least not for our purse) – thanks for sharing! Is there a ‘best’ time? Doubt it. Anytime is good and rewarding. Hi Red, Thank you for viewing my blog, leaving a comment, and joining my followers. Please stop back often. Appreciate your invitation to come to Australia. I might just do that. It’s a place I’ve always wanted to see. Fabulous photos Red…mine are still in my camera!!! I just love this part of Broome. We went most nights for sunset drinks on the beach and often a beach barbecue. I didn’t get to see the dinosaur print this trip but I have to leave something so I can go back next year!! Fine series of photos of a very colorful place. @Andrew – Yes, the other dino footprints are about to be mined into oblivion … Stick around! I’ll show you the highest tides in the Southern Hemisphere shortly! @Saucy Kod – It’s one of those universal places with something for everyone! @Beth Edwards – Thank you! It’s a killer view at anytime, but the sunsets rock! @Filip & Kristel – It’s one of Australia’s best! @Taken for Granted – Thank you! Come on down anytime if you’re going to make comments like those!! What a piece of nature. Great pictures. I think I would want to enjoy all the coming and going of tide, including sunrise and sunset. Beautiful colours Red – love the bingle bingles and the coral and would definately want to join those fellas fishing. Sounds like a grand place to be. And a mere two hundred kilometres north, dinosaur footprints, hundreds of them. I would love to see the amazing tidal movements. @Carole – Although I tried really hard, I think it’s impossible to take a bad shot there! @Rubye Jack – The only other times I’ve seen such blue it’s been fake!! @diane b – You inspired me! We went there 3 times at different tide heights and different times of the day. But really, I could happily have gone there EVERY day! @FruitCake – Hahaha! So THAT’S the reason for the monster tides! And you’re right – countries like this are hard to come by! @Windsmoke – I didn’t realise the pix would turn out this good. But no credit to me – I just stood there and clicked! @River – There’s red rocks and then there’s RED ROCKS!!! Don’t miss this one when you retire! @Rose – Thank YOU! Glad you enjoyed it – and if you haven’t already seen it, go there!! It’s SO much better live!! What a fascinating place Red, the colours are awesome and you’ve captured the landscape of the area so beautifully. Thanks so much for this. I love those red rock formations! the Bingle Bingles are fabulous. The colours are so bright and clear. Bonza photos. The Bingle Bingles, sunset at Ganthesume Point and the dinosaur foot print get my vote. It is just amazing how nature comes up with such wonders! I love the intensity of the colors here–beautiful! Red sand and sunsets. They don’t make countries like this anymore. And if a dinosaur has been stomping around on the beach… no wonder the tides can be so deep. Isn’t it the most colorful place to be. I see you outdid my photos by being there at sunset. I love the shadows of the people. Well done. Such a gorgeous sunset and what blue blue water against the red red cliffs. Amazing!